If an emergency were to strike, would you be prepared? Staying calm and knowing what to do in case of disaster is the first step, and listed below are common emergencies, what you should do, and tips for mitigating the consequences. Before getting your dog ready for travel, you should prepare a few key items. First, print off your dog’s veterinary and vaccine records, just in case you need to make an emergency visit to a veterinarian. Next, ensure your dog’s microchip and tag information are up to date, in case of the unfortunate scenario that you lose your pet. In addition, be sure to have a recent photo of your dog available. While traveling, it is essential that your pet remain restrained in the car, either in a kennel, with a seat belt, or behind a pet gate. This not only prevents your dog from distracting the driver and potentially causing an accident, but also protects your dog should an accident occur. Thousands of unrestrained dogs are injured annually in car accidents, even when minor. If not gravely injured, they also face an increased risk of bolting from the scene and becoming lost or struck by an oncoming car. If your dog accompanies you on hunting or fishing excursions, you must always be prepared for any type of situation that may arise, from getting injured or becoming lost. Your dog should always wear a collar with identification tags whenever off-leash. In addition, an adequate amount of training should be devoted to teaching your pet commands such as “come,” “stay,” and “place” long before you ever test your dog’s skills in an area where many distractions and temptations exist. Hunters should also carry a canine first aid kit that is well-stocked with materials such as tape, gauze, hydrogen peroxide, tweezers, antibacterial ointment, a blanket, and scissors. A guide to field-dressing canine wounds is also recommended. Common field injuries include broken bones, puncture wounds, abrasions, embedded thorns or porcupine needles, and hypothermia. Dogs have a tendency to investigate the world around them with their mouths, which can make walking an exceptionally curious dog a hazard. 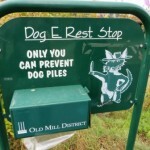 Teaching commands such as “drop it” and “leave it” can prevent an accident from occurring. If your pet eats or drinks something dangerous, such as anti-freeze or rocks, call your veterinarian immediately. If you know (or suspect) that your pet ate an item, but are unsure what it was, monitor your dog closely for symptoms of nausea, gagging, drooling, excessive lip licking, swollen stomach, pain, food refusal, and constipation. If these symptoms occur, your dog needs immediate medical attention. 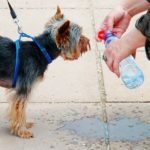 Besides teaching your dog preventative commands (these only work if you spot the item before your dog can ingest it), using a short leash during walks is also recommended. Although dog parks have numerous benefits, such as giving your pet an opportunity to socialize and expend excess energy, they are not without risks. 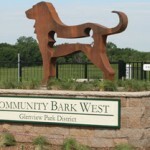 One major disadvantage of the dog park is increased risk of a dog fight, which is a potentially deadly situation. There are many ways to break up a dog fight. One option is to create a loud noise, such as by using a whistle or an air horn, in order to momentarily distract the dogs and separate them. If this does not break them up, a large stick can be –carefully – inserted between the dogs to disengage them from one another. Be extremely careful in doing so, as this may cause the more aggressive dog to turn on nearby animals or humans. If two or more people are present, another alternative is to each grab one of the fighting dogs by the back legs and pull them away from one another, until they reach a safe distance apart and both can be leashed. If in doubt, do not attempt to break up a dog fight and instead call animal control immediately. 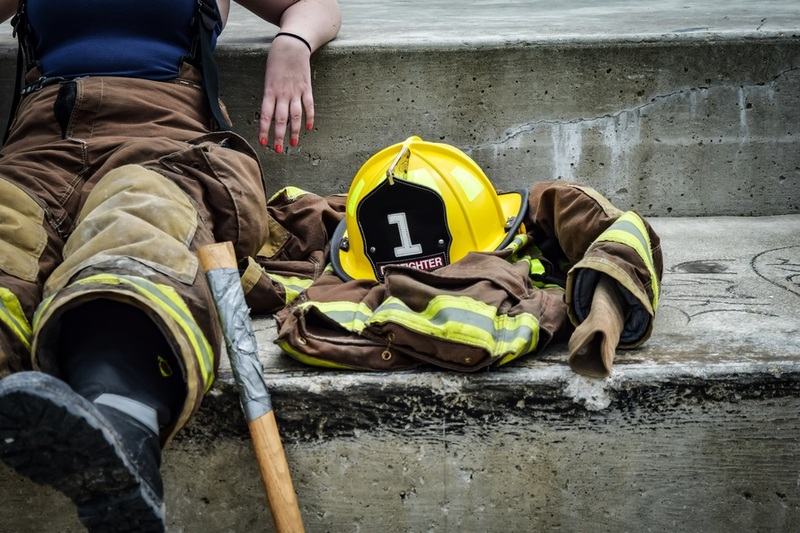 Although no one wants to think about what would happen should a disaster strike, it is important to have a plan should there ever be a fire in the house. Pet alert stickers can be purchased from pet store that let firefighters or emergency personnel know that an animal is in the house. Simply place this sticker in a prominent location (such as on the front door), so that an attempt can be made to save your pet. If your geographic region is prone to natural disasters such as hurricanes or tornadoes, make sure your pet is prepared in case of disaster. Your dog should be microchipped and have a collar with up to date information. In addition, your dog should be muzzle trained, as emergency rescue workers typically muzzle the pets they rescue in order to save as many dogs as possible. If your dog refuses the muzzle he or she may be left behind. A second type of emergency that can occur in your home is your pet choking or requiring CPR. Pet owners should acquaint themselves with the canine version of the Heimlich maneuver, as well as how to give chest compressions and artificial respiration to any size animal. Another emergency situation that pet owners should be prepared to deal with is a dog bite, particularly if their dog bites another human or animal. Regardless of the reason for the bite, remain calm in this situation. You should help the victim seek medical attention immediately if any skin was broken, as the risk of infection is high. 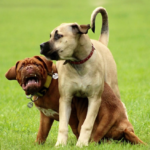 Do not physically punish your dog for biting, as this can make an already dangerous situation worse. Instead, remove your dog from the area and isolate him or her, such as in a bedroom. Next, contact your local animal control agency and be honest about what transpired, recapping the story as accurately and objectively and possible. Finally, be prepared to present proof that your dog has been vaccinated for rabies, or risk your animal being placed in quarantine. It is important to understand that even one bite on a dog’s record can label him or her a “dangerous” dog. Minimize the risk of dog bites by properly training your pet and educating others – especially children – on appropriate behavior around canines.